Residence Life at York University is excited to be hosting Rejuvenate: OACUHO 2015 Spring Conference from June 7-11, 2015. York University was founded in 1959, and is the third largest university in Canada. We host approximately 53 000 students, more than 7 000 faculty and staff, and a number of alumni and international students from across the globe. In residence, we house approximately 2 400 students between our two campuses. OACUHO is a not-for-profit organization which attaches great importance to support all facets of University and College housing operations, student success and the academic mission of the institutions in which each member serves. They are committed to serving the needs of our members and their institutions by providing life-long learning, effective and relevant networking, and support for our membership. For more information about OACUHO, you can visit their website at www.oacuho.com. The Host Committee has planned a week filled with engaging speakers, interactive presentations, and a variety of social opportunities. We also will be unveiling the name of our Faculty in Residence, a distinguished professor and researcher in the field who will be joining us for the week and providing insight into the discussions. The conference, however, cannot be the success that it is without the enthusiasm and participation of its delegates. We encourage you to connect with us through social media for updates, to share ideas, or ask questions. Our contact information can be found on the Contact Us page. 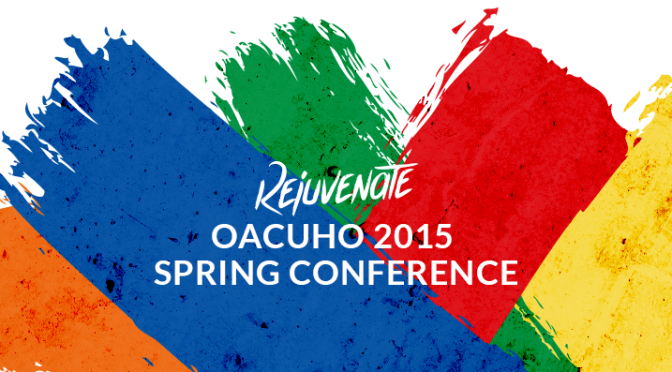 ‘Rejuvenate’ is the theme of the OACUHO 2015 Spring Conference for many reasons. The act of rejuvenation will look different person to person, but the act is deliberate as a means of improving and re-committing the passion for the role we play within Housing and Residence Life. As an opportunity to take stock, learn from colleagues and prepare for the coming academic year, we hope you will join us as we work to bring about new zest and zeal for those in the Residence Life and Housing areas so we may best serve our communities. Rejuvenation is a process of renewal, for individuals, for facilities, for practices and for ideas. Considering how we care for ourselves is essential to best enable the proper care of others. To rejuvenate can look very different from one person, or from one place, to the next – we believe exploring and highlighting this process will be helpful to individuals, their practices and their campuses as they move into the future. We look forward to REJUVENATING with you soon!